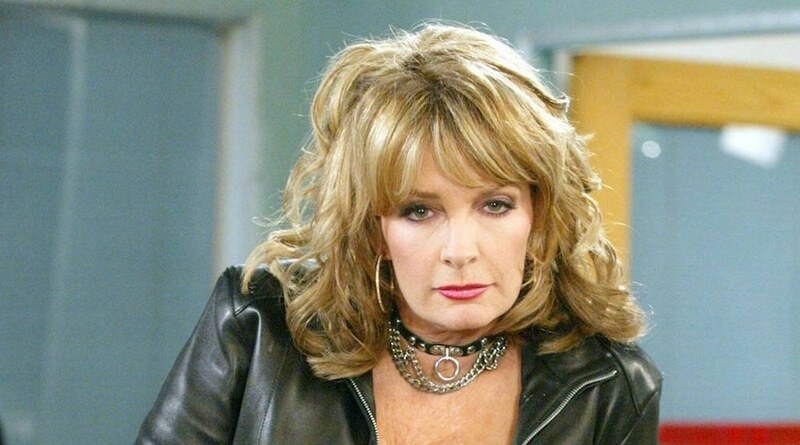 Days of Our Lives spoilers reveal that Hattie Adams (Deidre Hall) will have an epic Halloween nightmare. DOOL had fun with the Halloween episode last year. This year will be no different. Last years Halloween episode featured Abigail Deveraux’s (Marci Miller) nightmare. This year it will be Hattie Adams’ nightmare. Hattie Adams thought she had it made when she took over the life of Dr Marlena Evans (also played by Deidre Hall). However, this Halloween, Hattie will have a frightening nightmare involving some of Salem’s most popular residents. Days of Our Lives spoilers show that Hattie’s dream will include memories, phantoms, and crazy clues. In a recent Soap Opera Digest article, head writer Ron Carlivati stated that he looked to the big screen for inspiration. He was leaning towards The Exorcist since Marlena Evans was once possessed by the devil. However, Abigail Deveraux’s pregnancy led him to the movie Rosemary’s Baby. In the movie, the father is the devil. Ron had to think who is Salem’s devil? One character came to mind, Andre DiMera (Thaao Penghlis). Carlivati also teases there will be surprises and twists that impact Marlena and John Black’s (Drake Hogestyn) current storyline. As reported previously, Andre DiMera will return to DOOL. His return will only be temporary, but he will be returning again at a later date. Hattie has a history with Andre. He was responsible for her going to jail. However, it seems that Andre’s return will have more to do with Abigail than Hattie Adams. With Doug Williams (Bill Hayes) and Julie Williams (Susan Seaforth Hayes) at Abigail’s side, we will see her glance at her new bundle of joy. Shockingly the baby doesn’t look like Chad DiMera (Billy Flynn) or even Stefan DiMera (Tyler Christopher) but instead a dead ringer for Andre DiMera. “Baby Andre” terrifies Abigail and for good reason. With everything happening in Abigail’s life, she doesn’t need a reminder of the brother-in-law that she murdered. Days of Our Lives spoilers also reveal that Andre is “the devil in the detail”. DOOL‘s preview video shows Dr. Rolf (William Utay) holding a gun on Abigail as she seems to be spinning. We will also see a cup of tea being stirred. Andre DiMera came back once to “help” Abigail. Could he be returning again for the same reason? These clues could mean that Andre helps Abigail prove she’s being drugged. Hattie Adams’ dream will also feature Princess Gina (Kristian Alfonso). We saw a glimpse of the princess during last years Halloween episode as well. Could the writers be giving the fans a clue? DOOL fans haven’t been happy with Hope Brady’s (also played by Kristian Alfonso) character for some time. There has even been fan chatter that maybe she is the royal Gina. The Hope Brady we all know and love wouldn’t shoot a man in cold blood or frame another man. Even if she hates them that’s not Hope’s style. It is, however, Gina’s style. Having Hope turn out to be the princess would redeem the real Hope in many fans eyes. Is her royal highness still lurking inside of Hope or does Gina only come out to play at Halloween? An old face appears in Hattie’s dream. Judith Chapman will appear saying “I’ve come back for you Marlena”. Chapman previously played Angelica Deveraux on DOOL. Angelica Deveraux (played by Morgan Fairchild at the time) died of a heart attack while arguing with Hattie Adams and Bonnie Lockhart (Judi Evans). Angelica certainly has a reason to come back to haunt Hattie because of her involvement in her death. Days of Our Lives spoilers recently hinted that Judith Chapman would be returning to the show but playing Diana Cooper. Leo Stark’s (Greg Rikaart) mother is believed to be named Diana Cooper. Fans will also see Kristen DiMera (Stacy Haiduk) laying on the ground with a bloody 666 written on her forehead. If there’s anyone who can give the devil a run for his money it’s Kristen DiMera. She’s wicked to the core. After the explosion at the warehouse, Kristen died. However, like her Phoenix father, Kristen will likely rise again someday on DOOL. ‘Days of our Lives’ spoilers: Stephen Nichols Phased out?